It’s not just Bill Murray who has to travel to Japan to sell whisky. 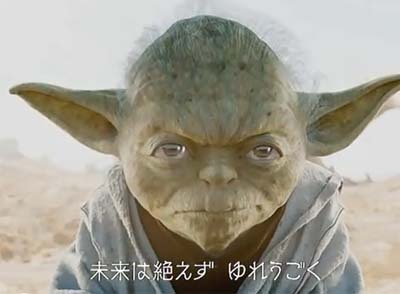 Yoda from Star Wars does too. To sell CM Cup Noodle Nissin, apparently. Let’s hope the little green chap at least got to meet Scarlett Johansson for his troubles. Thanks to Geekologie for spotting this gem.